Shoulderbag Tyre. Black. Size: H25 x W30/25 x D8 cm. Handmade of rubber car tyre. Fair trade from Honduras. Big backpack made of recycled rubber with grey zippers. 45 x 33 x15 cm. Fair trade by Emax Domina. Big backpack made of recycled rubber with yellow zippers. 45 x 35 x15 cm. Fair trade by Emax Domina. 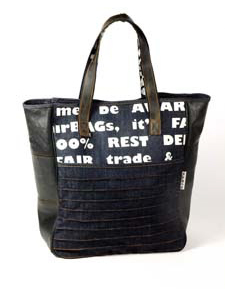 Denim shopper with rubber details. 42 x 31 cm. Fair trade by Fair Trade Original. Shoulderbag denim and rubber. 30x23x8 cm. With yellow text and details. Fair trade and recycled bag. 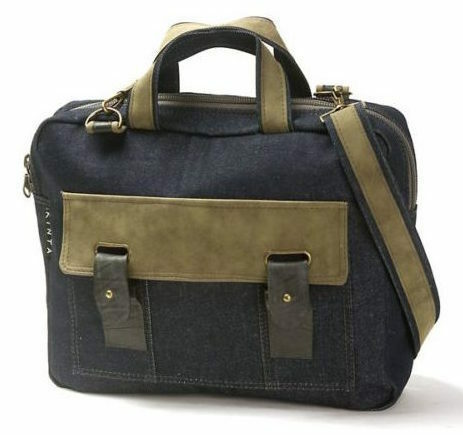 Laptop bag denim and artificial suede. Blue and green. With rubber details. 35 x 28 x 8 cm. Kinta. Big shopper or beach bag in denim. Size: W 50 x H 40 x D 7 cm. Fair trade by Kinta. Shoulderbag Tyre. Red. Size: H25 x W30/25 x D8 cm. Handmade of rubber car tyre. Fair trade from Honduras.